Techo savvy seniors can now avoid the dreaded Centrelink queues through a new smartphone and tablet app. Federal human services minister Senator Jan McLucas visited Mount Druitt Senior Citizens and Welfare Association last week to demonstrate Centrelink’s new Express Plus Seniors App. It has been launched 13,000 times since its launch in December. The free app is for those who receive the age pension and allows them to view and upload details, claim an advance payment, subscribe to online letters, report income and take photos of documents they need to send to Centrelink. Seniors make up 10 per cent of the Chifley electorate population, according to MP Ed Husic. North Queensland-based Senator McLucas told how her elderly father aged has become computer literate in the last year during her second Mount Druitt visit in as many months..
‘‘Age is not a barrier to use this, nor should seniors miss out on the opportunity,’’ she said. Those who don’t have a smart phone or tablet can use Centrelink’s self-service screens. ‘‘It does not replace people’s ability to go to Centrelink,’’ Senator McLucas told the Star. 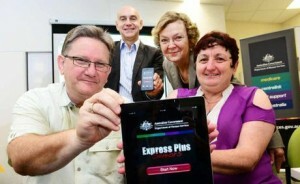 Express apps are also available for families, students and job seekers on Centrelink benefits. The visit was also a chance for Mr Husic to raise Mount Druitt Centrelink with the minister. He wants to see a ticketing system installed to reduce waiting times and gets regular complaints from constituents. St Marys-Mt Druitt Star Facebook fans agree. ‘‘It is a joke. You wait in the line for about 30mins to an hour most days just for them to tell you your next appointments and that’s it,’’ Naomi Feeney said. You can download an Express Plus mobile app from the App Store and Google Play™.